Kathleen Chalfant in Rose. Photo by Carol Rosegg. 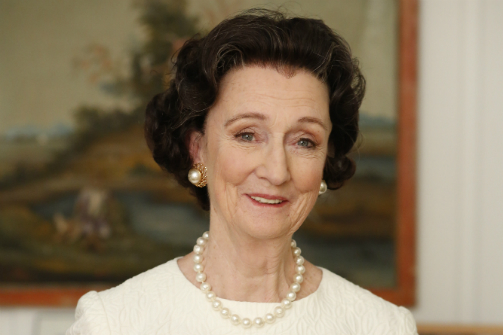 BOTTOM LINE: A solo Kennedy biopic from the perspective of the family matriarch brought to life by the legendary and infallible Kathleen Chalfant. Set at the Kennedys' home in Hyannis Port, MA, in 1969, Rose revolves around the beginning of Edward Moore "Ted" Kennedy’s infamous car accident scandal. As many may remember, Teddy has accidentally driven his car off a bridge and although he was able to swim out and survive, his passenger, Mary Jo Kopechne, was not so fortunate and drowned. In his desolation, he comes home to mother. "We feel pain and then we get up," urges Kathleen Chalfant as the titular, sole hero Rose Kennedy as she recounts how she consoled her devastated son. Chalfant channels the ultimate “Grand Matriarch” from reserved to unwavering to stifled to vulnerable. Guilt-ridden and broken, Ted goes out on a meditative sail the following day, and here is where we meet Rose diligently awaiting Teddy’s return. "Teddy says he can’t go on unless he gets a new life.” As the minutes turn to hours, with a media circus building in their front yard and still no word or sign of Teddy, Rose maintains her cool composure with a little help from us, her audience. To maintain her bearings in the face of impending controversy, Rose takes us on a stroll down memory lane during which she recounts the entirety of the Kennedy family history up to 1969 through personal stories and projections of family photos. Based on nearly 40 hours of taped conversation with the actual Mrs. Kennedy, Rose is a rare and personal glimpse into this great woman's life and legacy. Ms. Chalfant is of a caliber of actress with whom you feel grateful to be in the same room. With a repertoire that crosses mediums and spans decades—from the ground breaking production of Angels In America on Broadway, to her current reoccurring part on the acclaimed TV series The Affair—it is pure joy to watch Ms Chalfant at work. The backbone of the family, Rose is never quite in the spotlight, yet she burdens all of the grief her children suffer at the hands of resentful Kennedy critics throughout the ages. Never flinching or showing emotion in public, in front of us, Chalfant finally lets Rose open up. Anyone who has studied the Kennedys will appreciate the diligence with which playwright Laurence Leamer goes to in capturing Rose’s awareness of her family’s position. Even now their legacy is fierce and steadfast. Ms. Chalfant allows us to discover what being a ‘celebrity’ once meant. In an era of reality TV stars-turned-cultural-icons, Leamer's play is an examination of an era when public figures had more to offer than pure sensationalism. Ms. Chalfant is remarkable, opening Rose up to us personally, distinguished and always relatable. She quips sarcastically when describing Teddy’s wife: “Joan [Bennet] was Joe's [Patrick Kennedy Sr.] idea of solving a problem." Sly and a little wicked, Rose doesn't mind the facts: "Teddy drinks too much.” Seamlessly Ms. Chalfant captures the staunchness of the matriarch, too. Rose elucidates the code by which she lives and has raised her daughters by, “I’d rather be the mother of a President than be the President.” Though problematic to hear now, Rose is at all times dignified, and Ms. Chalfant paints her as a complex contradiction of self-empowerment mixed with self-sacrifice. Director Caroline Reddick Lawson guides Chalfant with a stern grip and a keen eye on nuance. Together, their collaboration is strong, creating an interesting character study of this American icon. The design team is without flaw. Anya Klepikov and Lianne Arnold’s projections are memorable and tastefully restrained. Caitlin Smith Rapoport’s lighting design is organic and soothing. The evolving soundtrack through the decades is perfectly sparse, while the sound-scape of crashing waves and sweeping news helicopters is dead on, crafted tactfully by sound designer Jane Shaw. Costume designer Jane Greenwood has dressed Kathleen Chalfant impeccably—stylish and reserved, her ivory white pantsuit is elegant and comfortable, capturing Lady Kennedy’s vibe spot on. Relying entirely on Ms. Chalfant’s exquisite capacity for subtlety and nuance, Leamer's script is unfortunately mostly a textbook of Kennedy history and family trivia. As someone who had only a rudimentary knowledge of the Kennedys' past or present, I appreciated his diligence to educate his viewers of the impact that Rose and the Kennedy’s lineage has had on US politics and culture. However I'm left feeling unsure as to why Nora's Playhouse has chosen this story to tell right now—the messages of the play are complicated but seem to have only very loose ties to any topical, present day issues. As a whole, if not for the fantastic performance, the play is without a basic dramatic drive. Rose is written by Laurence Leamer and directed by Caroline Reddick Lawson. It stars Kathleen Chalfant. Costume design by Jane Greenwood. Scenic design by Anya Klepikov. Projections by Anya Klepikov and Lianne Arnold. Light design by Caitlin Rapoport. Sound design by Jane Shaw. Properties designer Ashley Flowers. Production Managed by Joshua Kohler and Stage Managed by Emily Paige Ballou.